To celebrate the retreat’s 15th year, management are teeing up cosy weekend getaways for couples this winter. Winter is the time to experience Ibiza’s countryside. Fields bursting with flowers and buzzing with life; sun-kissed walks; mild temperatures — the list reads like a call to get outdoors and experience nature in all its splendour. 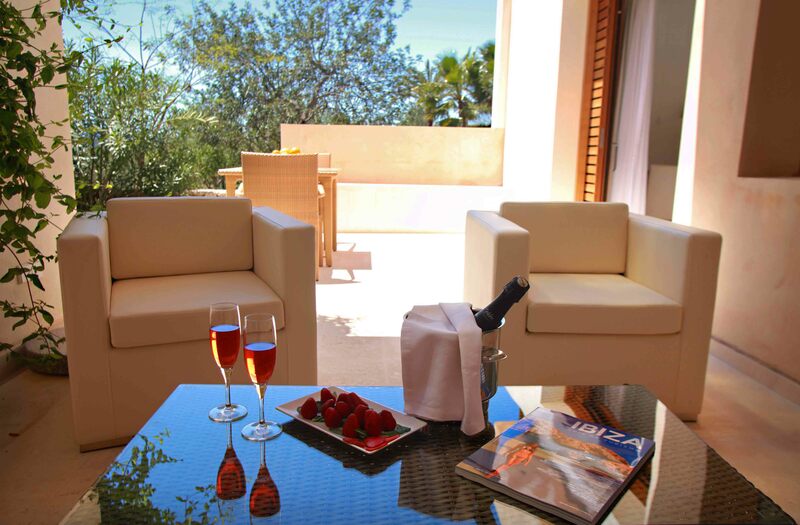 And with the arrival of Valentine’s Day at Can Lluc Country Hotel & Villas, so too, comes the love…thanks to a package deal specially concocted for lovers keen to share quality time in a romance-steeped setting. Valentine’s Day gift packs include a special romantic dinner prepared with fresh, natural ingredients against a backdrop that’s one of a kind. On a day for sharing unforgettable moments, your loved one will be greeted with candles, cava or chocolates. An assortment of room options are available with this particular pack. Based on availability, guests can choose between a simple room and a superior room with either living room and fireplace or hydro massage bath. Looking for state-of-the-art? Our villas are the perfect blend of design, comfort and amor, with terrace and private garden to win over both you and your loved one. And, if you fancy some serious TLC, complete massages-for-two are also an option. Then round out your romantically restful stay with a visit to our wellness space, a full-service breakfast buffet and tours of the island. In addition to our rural retreat’s gym, wellness centre and expansive gardens, there is a spacious hall where guests can hold any number of functions. Another option is to opt for a bespoke holiday package in group. It’s an original way to experience Ibiza without sacrificing luxury or privacy. Think of Can Lluc as you plan larger-than-life celebrations and romantic weddings; you and your loved ones will have full use of all of our hotel’s facilities. There’s more. At Can Lluc there is an endless list of ways to personalise your winter stay. Guided scooter tours of the island’s magic hideouts, chartered boat trips, visits of vineyards and wine tastings, hot-air ballon rides and much more. Eager for an unforgettable adventure? The only limit is your own imagination. Our boutique hotel is nestled in the heart of Ibiza in the Sant Rafel valley, flanked by fruit trees and trails for hiking and cycling. Need to disconnect? Yoga and meditation sessions are frequently held in the hotel’s gardens, a setting imbued with an unmistakeable sense of peace. The island switches gears in winter. It’s a far cry from the endless nights and wild, music-charged atmosphere of summer. This is Ibiza at its most authentic. Everywhere visitors turn, they are greeted with culture, gastronomy and tranquility…the traditional side of Ibiza. This winter, with more new and direct flights to places like Geneva, Milan and Amsterdam, Europe has never been so close. Flights to the white isle from cities like London, Paris and Eindhoven are also easier than ever. Put simply, Ibiza is the place to be, 365 days a year. Domestic flights serving Ibiza haven’t just held steady; they’ve multiplied. Malaga, Sevilla and Bilbao have now joined Barcelona, Madrid, Valencia and Palma on the list of cities with direct connections to the island. This winter, more than 8,500 flights will link Ibiza and Formentera with the rest of the world. That’s more than a million seats. Still need proof that the magic of Ibiza continues in the low season?